Glutinous rice flour is a wonderful thing– when cooked, it’s chewy and dense in the most pleasant way possible. Rice flour comes in two types, either glutinous or non-glutinous. Glutinous rice flour (aka sweet rice flour) is made from grinding short grain sticky rice, and its starch content is very high, making it a great thickening agent. Despite its name, it’s neither sweet nor does it contain gluten. Regular rice flour can be made from medium or long grain rice, and it’s used more commonly in gluten-free baking. I’m super partial towards the glutinous type, just because lots of my childhood favourites were made with glutinous rice flour… I can see myself going through a phase of subbing out regular flour with glutinous flour in my recipes, just to see how well that chewy factor fits with the recipe. The batter comes together quickly enough with no fancy equipment or tools required; there’s just the pesky step of making a white chocolate ganache, but thank god for microwaves, amirite? The cake is not the most attractive, but it’s full of character. It rises beautifully in the oven, cracking at the surface, then it deflates a little after you pull it out from the oven. 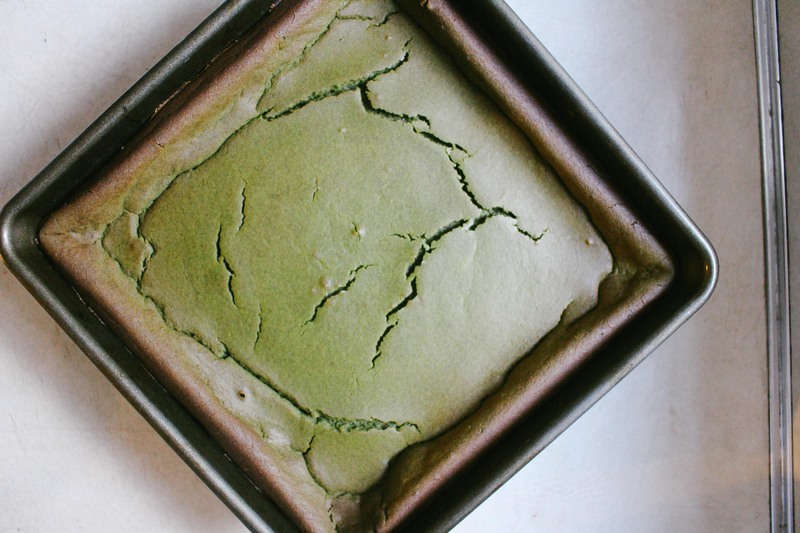 What I love about this mochi cake baked in a square pan is that it has different personalities depending on which piece you take… the sturdier corner pieces, with the golden crispy chewy edges, has a subtle caramelized flavour that complements the green tea really well. The centre pieces are super soft, springy and chewy. Mochi is best kept at room temperature to maintain its softness, because it’s an entirely different thing when refrigerated, turning hard and flavorless. However, I have had the unfortunate circumstance of finding mold on my mochi, and since tossing out mochi felt like I was committing a crime, I recommend storing these in the fridge. Once reheated in the microwave, they turn soft and chewy again. Better yet, pan fry these babies UP because the crispy exterior + chewy interior is to die for. Trust me on this. Something I often do when I bake is scale the sugar down as much as I dare to, then taste it afterwards and serve it with a drizzle of honey or a dusting of icing sugar. The wonderful thing about this approach is that you can taste the star ingredient, matcha in this case, much better. 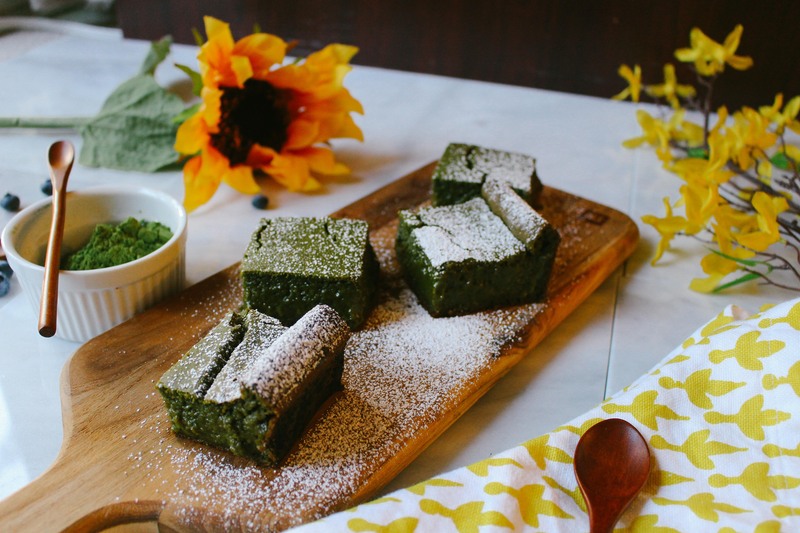 The problem I have with a lot of matcha desserts is that, for some strange reason, my tongue tastes vanilla as the prominent flavour. I have to be conscious of the fact that it’s a matcha dessert in order for my brain to be cognizant that yes indeed, this is supposed to taste like matcha. But I don’t want to think about it. I want it to hit me in the face with flavour. In this case, upon the first bite, my first thought was this tastes green. If green can be a taste. 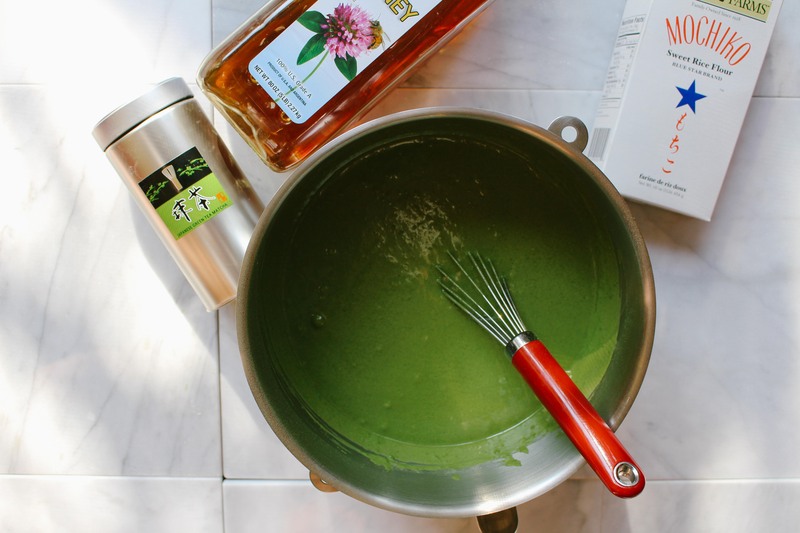 The same taste that ties wheatgrass shots, green juice, salad leaves and green tea together. Preheat the oven to 350°F and line a 8-inch square baking pan with parchment paper. 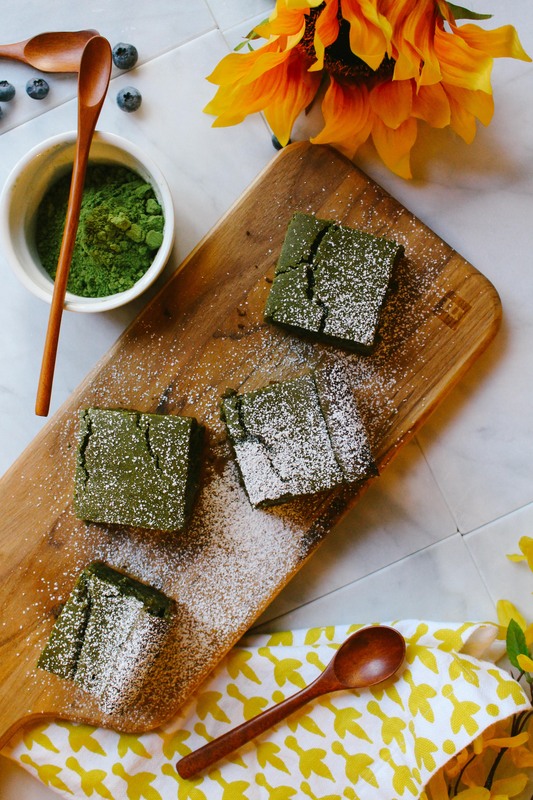 In a large bowl, sift together the glutinous rice flour, matcha powder, baking soda and salt. Whisk to combine. In a large microwave-proof bowl, microwave the white chocolate and 1/2 cup heavy cream, stirring at 20 second intervals until melted. Allow to cool. To the white chocolate ganache mixture, whisk in 1/2 cup of honey, 3 cups of milk, 2 tsp vanilla extract, and 2 eggs. Sift the dry ingredients over the wet, and whisk furiously until it’s incorporated and there’s no lumps remaining. Pour into the prepared pan and bake for 66-70 minutes, or until the cake no longer jiggles a lot in the centre. The finished cake should have golden brown edges, and a slight wobble in the centre, but it should definitely be firm to the touch. Dust generously with icing sugar, and enjoy! As mentioned above, this cake is very prominent in matcha flavour. 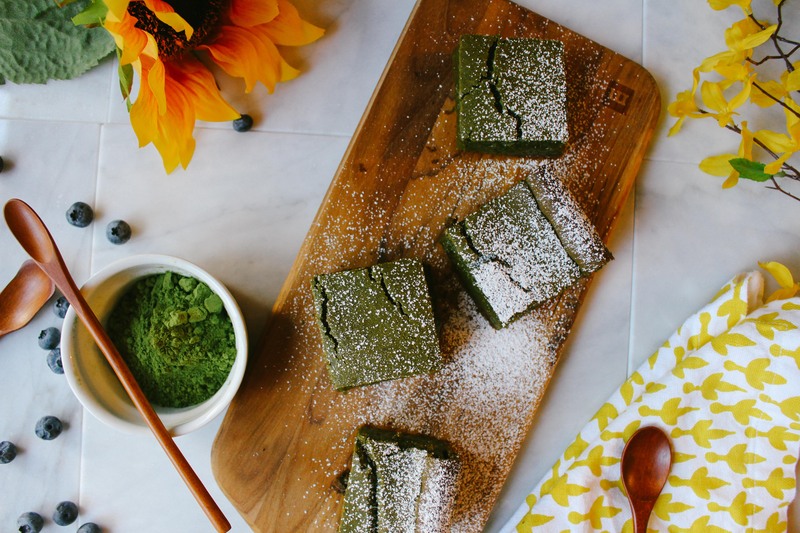 Scale down the matcha powder to 3 or 4 tbsp if you’re looking for a more subtle flavour. The cake is also not very sweet by itself. Increase the honey to 1 cup if desired, or stir in 1/2 cup of good quality white chocolate chips at the end, for a definitively dessert-like cake. For the 3 cups of milk, I used a combination of 1 cup heavy cream and 2 cups of organic almond milk. The original recipe calls for evaporated milk. I’d think it’s pretty flexible, so long as you don’t use non-fat milk. I recommend greasing your measuring cup lightly with oil before measuring out the honey– slides right out of the cup like a dream. I can’t wait to try this recipe, it looks delicious!! such an interesting recipe! ive never thought of substituting regular flour with glutinous rice flower, especially since I love to eat chewy things!